F&D Defense is pleased to announce Daniel Defense’s recognition of the superiority of F&D’s four bolt rail to upper interface. 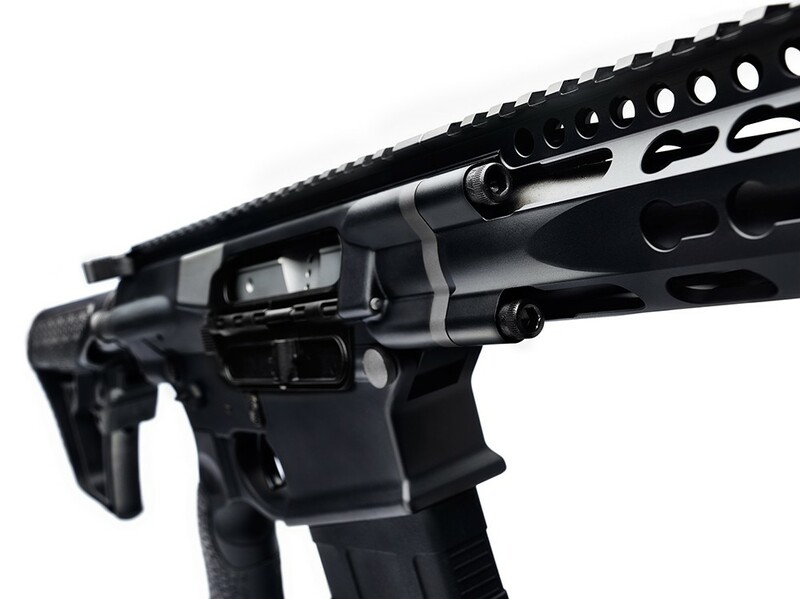 Close-up of F&D Defense 308 rifle, the first in its class to employ the innovative 4-bolt lockup interface. When Daniel Defense decided to build an AR10 (DD5V1) and release it last month, instead of using one of their many patented rail designs, they chose to use F&D Defense’s four bolt interface that removes the barrel nut and creates the strongest most rigid interface in the industry. This F&D design dates back to 2009 and has been shipping since 2011. We knew then that it would only be a matter of time before others in the industry recognized the strength, simplicity, and efficiency we had built into each of our rifles. Hats off to Daniel Defense for recognizing a “best in class” rifle from F&D Defense and incorporating some of its strengths into their latest model. Daniel Defense’s engineering department is to be commended for putting the end user first, even though it required validating a competitor’s rifle. While we commend Daniel Defense for their integrity to offer the best to their customers, we would at the same time remind them and the industry that it was F&D Defense that innovated and brought this advancement to the AR world. Some periodicals highlighting the DD5 and some advertisements for the DD5 would lead the public to believe that Daniel Defense created this design and released it this year. This press release is written for the purpose of clearing up any confusion that might be created by these misinformed articles and advertisements. There are plenty of F&D customers that would also dispute any misconceptions. We would like to thank a major player like Daniel Defense for bringing deserved and overdue recognition to the talent and innovation that many smaller manufacturers like F&D Defense bring to the gun world. Marty Daniel, President and CEO of Daniel Defense, has noted: “The only way to guarantee quality firearms is by doing it right the first time.” We couldn’t agree more, and are honored that when a major firearms manufacturer needed their AR10 to be right, they did it the F&D Defense way.